Ivo Steijn writes to me from California with a useful method of distinguishing genuine DVR (Far Eastern Republic) overprints. He tells me that on the genuine DVR monogram, the top half of the upright stroke of the central letter ALWAYS has a small protrusion on the left side. See the enlargement he has supplied. He says he has never seen a forgery which reproduces this feature. 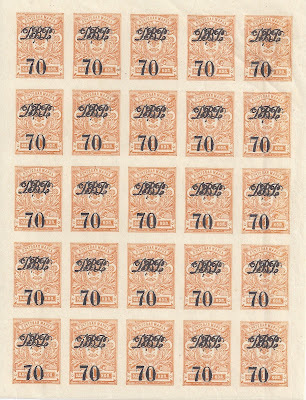 However, this distinguishing feature is only found on the small DVR overprint (applied to kopeck value stamps such as the 1 kopeck previously overprinted with Kolchak "70" shown here)and by the time it is applied to stamps in combination with a Far Eastern Republic surcharge ( 7 kop on 15 kop and so on)the protrusion has been removed. 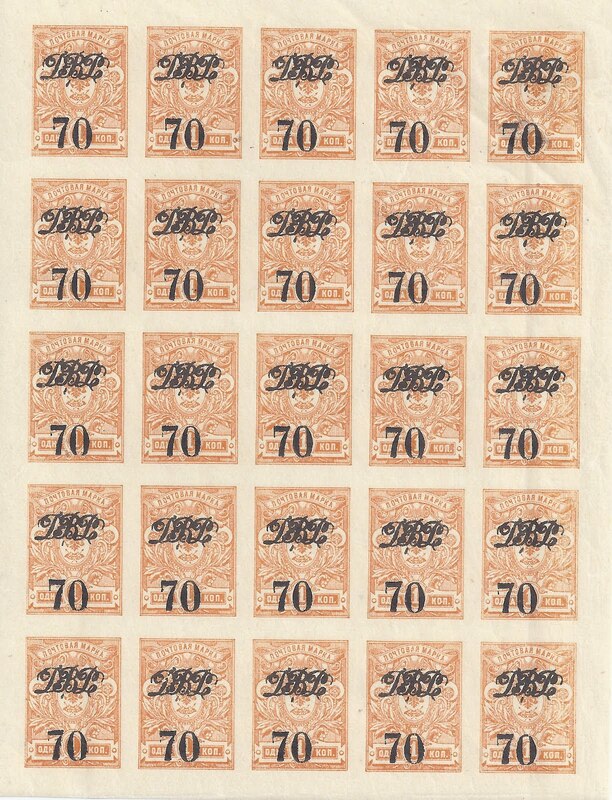 But on the illustrated block of 25, every stamp has Ivo Steijn's identifying mark. This is a very useful piece of information - forgeries of the DVR overprint are common.